Today's the day I finally share our Master Bathroom Makeover!!! We've been wanting to have work done to this bathroom since we first moved in, but since it was hidden away from the rest of the house it sat on the back burner since 2007. We painted the walls this dark blue-ish/grayish color and I "tiled" around the tub. We organized the drawers and did our best to keep this space clean...but for the cleanest it ever became, it still was a mess of a room and it never functioned how we had hoped. For twelve years, TWELVE YEARS, we lived without a shower in this space, only a tub. We found ourselves dancing between bathrooms. I'd take soap and shampoo from bathroom to bathroom, towels would constantly move around and toothbrushes never stayed in one place. With the kids growing older we no longer wanted to take turns using their bathroom and I'm sure they appreciate not seeing us in our birthday suits! LOL! They now have their space and we now have OUR space. My "tile" job all those years ago. There was a point that I could no longer live with the fish tile that adorned these walls, so I found some extra tile and had at it. We never decorated, the tub, while super comfortable, had seen better days, those measly, crooked hooks were usually draped with towels, robes and clothes and that ledge NEVER stayed clutter free. Oh, then there's this; the infamous cardboard in the ceiling. Two days after Eliza was born we came home with a newborn and smelled the smell of death. In a quick attempt to remedy the issue, Jon cut into the drywall and found that a bunch of baby birds had died in our attic. Super sad, I know. Jon cleaned out the space and there the ceiling sat, protected by a piece of cardboard for five years. We'd laugh at how classy we had become, but tending to the kiddos had become far more important that fixing the ceiling. That piece of cardboard had also become a joke about our house and bathroom and it had somehow grown on us...because we're weird like that! The most difficult part about changing this bathroom was the removal of the tub and remembering all the times the kids took their baths together in this space. The beginning of construction or should I say, the removal-of-all-the-things - OR, better yet - as Chip Gaines would say, DEMO DAY! Do you see all that orange? Yeah, the owners before us had not only had fish tile at one time, BUT they had also decided that orange walls were a good idea...and they didn't stop there - the ceiling was also orange at one point, as well. Oh my - I was getting reaaaaally excited right here! I could finally start to see it; how it was all coming together! I had Jon hold up this mirror at least 392 times a day. Weeks passed and the walls were painted, the tile was grouted, the vanity was placed and the shower head was added!!! I still have hooks to add and shelving to put up, but that will all come in time. I couldn't wait another minute to share this space with all of you! 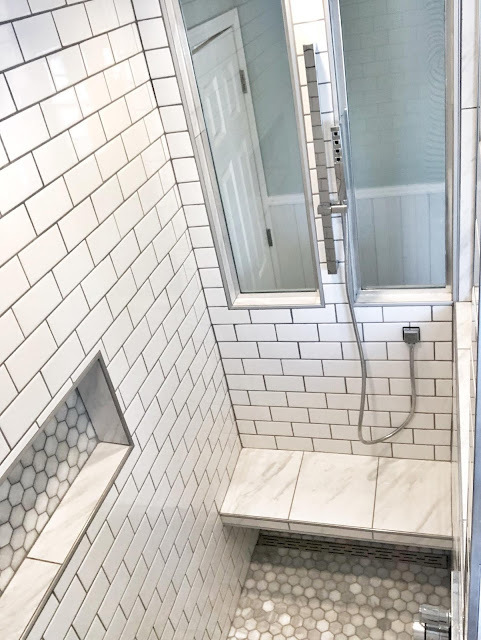 The interior of the shower. That rain shower head has my heart! 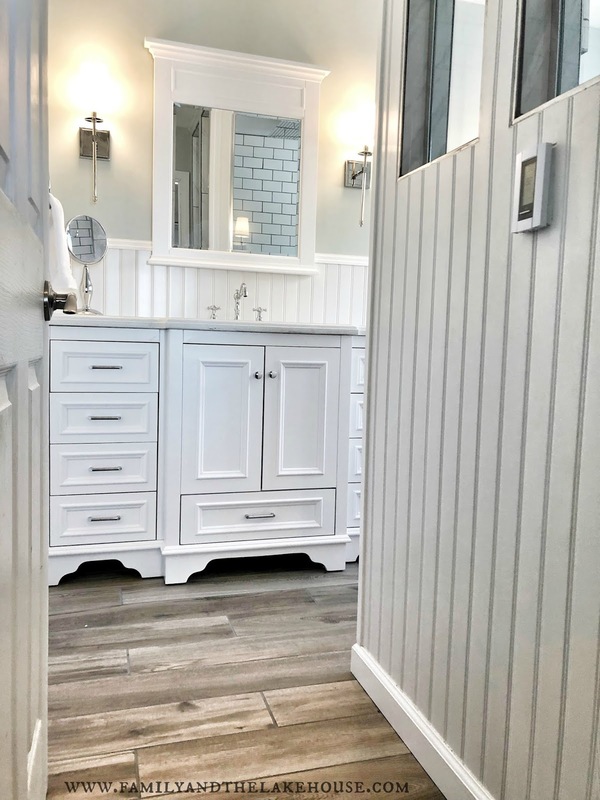 All the beadboard is waterproof, too! YAY! Funny story here...well, not so funny to our contractor, I'm sure, but our construction guys were <this close> to finishing with the beadboard work, but they needed seven more pieces. Our contractor called everywhere in the surrounding area, but he ultimately had to drive to Ohio...two hours away to acquire an additional seven boards. Jon and I felt terrible, but our contractor made it work. 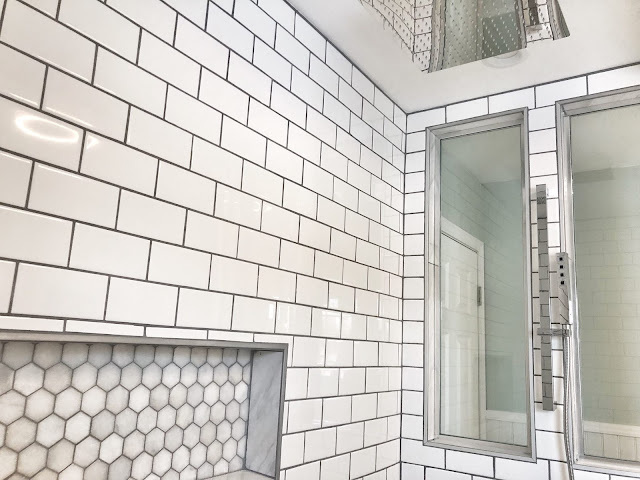 I still can't believe this is our bathroom. It's tiny, but mighty and I can't get over how light and bright it is now! If you're interested in a source list, please let me know! 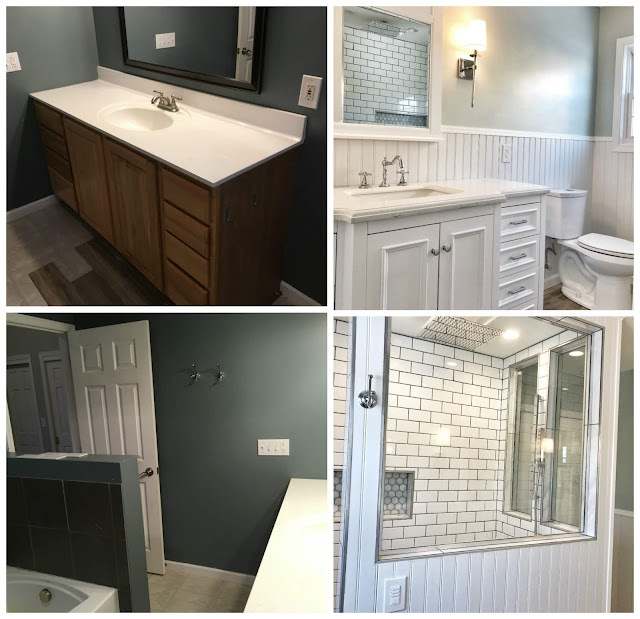 Thanks soooo much for stopping by and checking out our master bathroom makeover! I'll have to post about the kids' bathroom next. 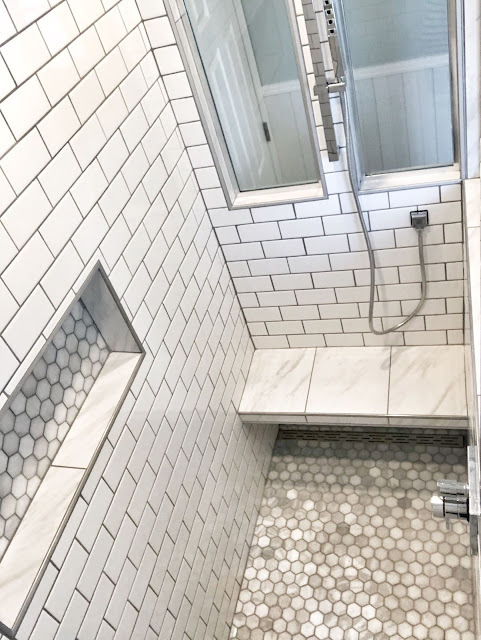 It's a fun room with lots of functional space for such an itty bitty bathroom! Stay tuned! I'm linking up with Lindsay for Welcome Wednesday and Nicki for Totally Terrific Tuesday and Jenn for What's Hap-"Pinning" Wednesday and Bonnie for Pin Junkie Pin Party!